SELECTSHRED | ON-SITE SHREDDING VERSUS OFF-SITE SHREDDING—WHAT’S RIGHT FOR YOU? By: richard , Categories: General News , Comments Off on SELECTSHRED | ON-SITE SHREDDING VERSUS OFF-SITE SHREDDING—WHAT’S RIGHT FOR YOU? Sometimes it’s hard to believe that some businesses don’t know if their documents are being shredded on-site. Even more unbelievable, are those who discover by chance that their documents are being carted away to be shredded off-site – not shredded on-site as they thought. On-site shredding is having your documents shredded at your location. Off-site shredding is having your documents transported to another location to be shredded. Let’s be clear – it’s not illegal, it’s not unethical, and it’s not wrong to have off-site shredding. However, every individual and business should know what happens to their documents when their sensitive information is handed over to a third-party document destruction service. However, if you have a healthy dose of paranoia and would prefer that your documents be shredded at your location – that is your right to know. Certainly, it takes more time, more fuel, and more time on-site for a company to shred your documents on-site but your peace of mind in knowing that your documents are really destroyed is priceless. On-site or off-site? Get an understanding of the difference between both options and be confident that your documents have been shredded. Take action to understand the implication of choosing one over the other because the accountability will rest with your company and its decision maker regarding the proper destruction of the documents in your custody. With the increase in information security breaches and identity theft, companies are more likely to choose on-site shredding to be sure their confidential information has been destroyed. Even when your documents are stored off-site, it is still your responsibility to ensure that the documents are properly destroyed and a certificate of destruction is provided by the entity that shredded the documents. For the utmost in safeguarding the confidential information in your custody, use a mobile/on-site NAID AAA Certified document destruction company to destroy your confidential documents and your hard drives on-site (at your location). Ask to witness the destruction process. It’s your right to have your shredding done right…on-site. Sometimes choosing off-site shredding can be like simply recycling – an accident waiting to happen. Read this article for more information. SELECTSHRED | HOW EDUCATED ARE YOU ABOUT DOCUMENT SHREDDING? By: richard , Categories: General News , Comments Off on SELECTSHRED | HOW EDUCATED ARE YOU ABOUT DOCUMENT SHREDDING? Know the importance of shredding. You are not throwing out trash. Your business reputation and customer/client relationship depend on your knowledge of why it’s important to shred the confidential information in your custody. It also includes knowing the steps to fight identity theft and information theft by implementing systems to make sure that your documents are secure until they are ready to be destroyed in a timely manner. Understand the reasons for shredding. Your company can be fined or otherwise penalized if it is not compliant with local, state, and federal regulations. It is also important to understand how your decision to avoid implementing a document destruction process adversely affects your customers, your public image, your employees, corporate ethics, and your trade information rights. Ascertain the credentials of your shredding company. Are you using a NAID AAA Certified Company bound by strict industry standards that includes background checks for personnel handling your sensitive documents? Are the companies you are considering carrying adequate liability insurance? Are your documents transported away to be shredded at a remote location and at a later date? Are your shredded materials being recycled at an appropriate recycling facility? Know the process by which your confidential information will be handled and destroyed, and know that your shredding company is equipped and certified to provide secure service. These are just a few steps in the education process as you are faced with deciding who will handle your document destruction services. It is always wise to remember that ultimately, the accountability rests with your company’s decision maker so make time to make wise choices. Residents came to the Stuart Police Department on Saturday, August 2, 2014 to have their confidential documents shredded on-site. They arrived before the scheduled start time of 10:00 AM and were still arriving after the closing time of 1:00 PM. 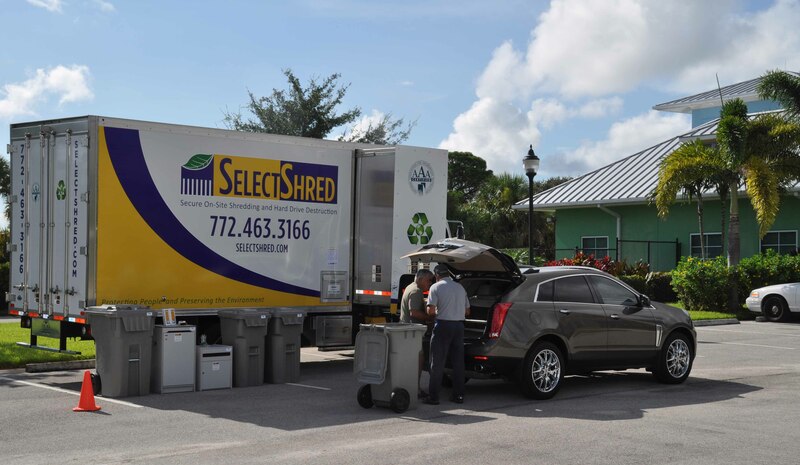 Due to the great publicity done by the Stuart Police Department, the free shred event to fight identity theft was a success. Over 113 vehicles with happy and appreciative residents rolled into the Stuart Police Department parking lot. Over 3.6 tons of documents were shredded on-site – a win for identity theft protection and for the environment – all destroyed materials are recycled into new paper products. The police department did a great job in promoting the event. People reported seeing the announcement on the television, in the newspaper, and on social media, as well as hearing about it on the radio, and from family, friends, and neighbors. They reported that they came from as far as Fort Pierce and Palm Beach. For those who requested to see their documents shredded in their presence, we honored their request. In addition to seeing their documents placed into bins and hoisted into the truck, they were able to watch the shredding through the video monitor on the truck. As law enforcement agencies and the media make an impact by promoting shred events, increasing public awareness of identity theft, and encouraging shredding of personal documents, the serious matter of keeping confidential information away from dumpster divers is being successfully driven home. Residential customers do not only want their information shredded but they insist that it is shredded in their presence. For residents, their objectives are to prevent identity theft and have peace of mind, knowing that their sensitive information is securely destroyed. We extend our thanks and appreciation to the Stuart Police Department for this partnership opportunity to fight identity theft. Residents who came expressed their gratitude for the service and the question of the day was “When are you doing this again?” Follow the Stuart Police Dapartment’s Facebook page for more information.